17-year-old G. on Rosh Hashanah: I accept my moments of weakness and of feeling alone, and hope to see the Shanti family around me, and know and feel that I am not alone. 18-year-old A. on Yom Kippur: I forgive myself for the fact that it's still hard for me to forgive my mother, who abandoned me at the age of two, and hope to learn more about compassion from Mariuma this year. 15-year-old K. on Hanukkah: Light for me is that I'm fighting, and not giving up on life. These quotes are taken from the sharing rounds held around every holiday table at Shanti House. Everybody shares: children, staff, guests and former residents, and together they celebrate all the Jewish holidays with the new family that they have created. Shanti House was founded in 1984. Ever since, it has been a shelter for tens of thousands of young people who were in immediate and real danger. In late 2009, Shanti House expanded its activity, opening the Desert Shanti House Youth Village in Israel's Negev Desert. This has enabled Shanti House to introduce new therapeutic tools, and accommodate young people outside central Israel, particularly in the south. Shanti House Association was founded by Mariuma Ben Yosef. In the year 2000, Mariuma received the President's Award for Volunteerism, and was honored to light one of the torches in the official ceremony held on the eve of Independence Day. Despite the unyielding dedication of Mariuma, who manages the Shanti House Association, together with Michael and a unique team that runs Shanti House, the organization's existence still relies mainly on donations, and this book is your chance to help. 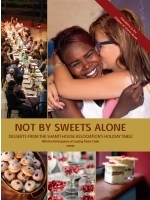 This book includes 60 dessert recipes from Israel's leading chefs, along with moving stories from the holiday table at Shanti House. For the past 30 years, tens of thousands of children have sat around that table. By reaching out for help, these children have chosen life. Proceeds of this book will be used to support the continued existence of Shanti House. The English version of this book was made possible thanks to our lifelong friends Marianne and Doron Livnat.